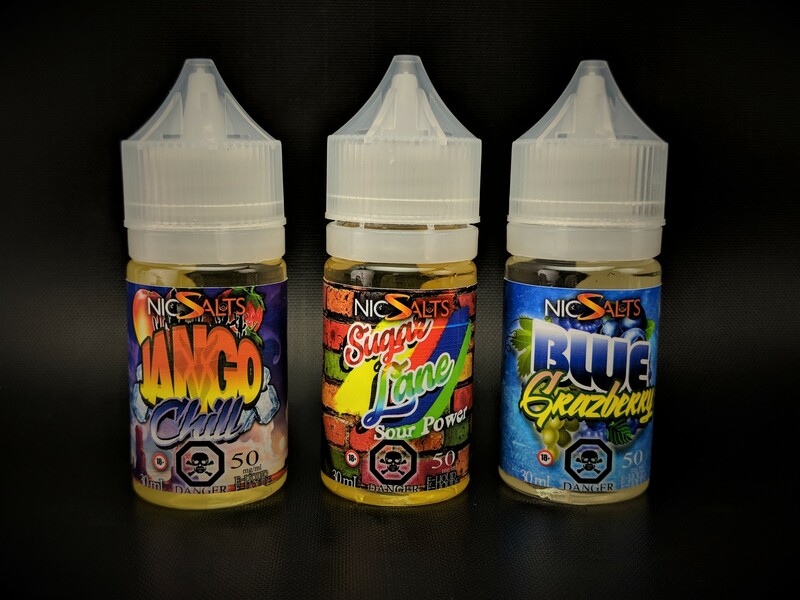 Here’s a look at a little sample set of new salt based liquids sent over from the boys at VanGo Vapes. From what I understand they are now offering all of their original flavours with both regular(freebase) and salt based nic. Admittedly I’ve already reviewed at least one of the flavours but I’ll still go over my thoughts on it. If you’ve never heard of VanGo before they make some absolutely incredible juice with one of the biggest selections of line ups and flavours I’ve seen from most any company. One thing I appreciate about them however is they are constantly refining their flavours, updating their look and changing up the lines. It means they are paying attention to what their customers like and want. Not only that but the company is run by a couple of brothers who are among the nicest guys I’ve ever had the pleasure of meeting. Here are my honest thoughts on a handful of salt based flavours from VanGo Vapes!! Setup: Testing was done mostly in a Noname mods NoToy with a 1.6ohm regular wire build using Puff cotton with the RDA rinsed and rewicked between flavours. I’ve also been using them in a number of pod devices including a Smok Novo, Uptown Tech Pod system and a Prime Soul. Remember taste is subjective and results will vary! Click the titles for links to the products!! My thoughts: A few years back I did a review of VanGos Sour Drips line and I’ll admit I was pretty far from impressed. They had cranked the sour factor up just a little too high for my liking and at the time I found it pretty much unvapeable, it was a pretty rough review. The VanGo boys however took it in stride, constructive criticism is always helpful especially if you care about your products and customers. Fast-forward a couple years and now they have Sour Power, a tribute to the classic rainbow coloured sour licorice like candy. The candy it’s based on goes by several names such as rainbow belts, sour belts, rainbow bacon or if you watch Epic Mealtime it’s often referred to as gay bacon. I think most people have fond memories of the bright coloured sour confection and VanGo must have too as they created a flavour that pretty much mimics the flavour or sour belts. It’s a very mild flavour and it looks as though VanGo has really toned down the sour aspect when compared to their original Sour Drips line but it definitely tastes like Sour Belts. I get the classic taste of sour belts which in and of itself is a hard flavour to describe but to me it’s like a light medley of artificial fruity flavours swirled together with a dash of sour. You don’t quite taste the rainbow like you do with Skittles but if you’ve ever enjoyed a piece of gay bacon you’ll be familiar with the flavour. Like I said it’s fairly mild but I think that’s key with a flavour like this as too much of that sour aspect can get a little overwhelming. Fans of the classic candy strips will appreciate this one!! My thoughts: If you read my reviews you probably already know how I feel about blue ras flavours. They’re pretty much a dime a dozen in this industry and this last year has seen an explosion of blue ras flavours from nearly every company out there. Unfortunately I’m not really a fan of the flavour especially after trying dozens upon dozens of them that all pretty much taste the same. I get that most companies try to change them up just a bit to make them more appealing but more often then not it’s still just blue ras with a dash of something else. With Blue Grazberry VanGo of course tries to do something just a bit different from the pack adding a touch of white grape to the flavour and while I do pick up the little splash of grape it’s not quite enough to save this flavour for me. For the most part it’s that classic mix of blueberry and raspberry that make a somewhat artificial tasting blue raspberry flavour. Anyone who’s ever tried a blue raspberry candy, slushie or whatever really will recognize this flavour. The little bit of grape as much as it helps really doesn’t set it apart from the crowd but is a nice little touch. For some off reason I didn’t mind this one as much in a pod device but it’s still not a flavour I can really get down with. Site description: A slightly cool blend of mango, jackfruit, strawberries with hints of cactus and lychee. My thoughts: Unlike the other two flavours in the set this one is exactly my kind of thing. I was already a huge fan of Cactus Jango and I almost always appreciate a little touch of cool in my fruity vapes so Jango Chill had a very warm welcome from me. The original Cactus Jango is an incredible mix of cactus, mango, strawberries and jackfruit with a touch of lychee for good measure. It’s one of the liveliest most refreshing tropical flavours out there and with a little extra dash of cool like in Jango Chill it sets this flavour completely off charts. Of the three this one got the most attention and is the only one that I actually finished from the set. The mango in it is thick and fresh and tastes exactly like the real thing. The jackfruit adds a bit of creamy tropical goodness while the cactus brightens it up making it really refreshing. The strawberry doesn’t really come to the fore and I’m guessing it’s mostly in there for sweetness and the lychee as well plays a smaller role but sort of punches the flavour up a bit since mango and jackfruit can sometimes feel heavy or thick. All of those additions of fresh flavours really makes it pop. It’s such a bright and lively flavour that I’m sure any fans of tropical flavours will appreciate this one!! I suppose this review should be more about the fact that their entire line is now available in salts as opposed to the actual flavours I received. The salt nicotine they are using is smooth and satisfying even at 50mg. The simple fact that they’ve made their entire line available in salts is pretty awesome meaning if you had a favorite VanGo flavour before now you can get it in salt and not have to hope and wait for it to be released. Most other companies only seem to be taking their best sellers or certain lines and converting them to salts so it’s a pretty big endeavor on VanGos part. If you’ve never tried out VanGo, you’ll be in for a treat when you check out their offerings. Of the three two of the flavours didn’t really appeal to me but they were still well crafted and made with quality ingredients. Jango Chill on the other hand I could bathe in, seriously boys send me over the big bottle next time 😉 So huge thanks to the gents at VanGo once again for setting me up with some of their incredible liquids! !